In the middle of March, the excitement starts. Search through the window for new arrivals. Every year the same impatience for migrants. When will they come? The Swallows, the Martins. And the one the Ancients called “Devil Bird”. All coming from Africa to stay for a while. The last to arrive, and the first to depart. With just a white chin patch, and a forked tail. And are complete for life in the air. Always alert, and minding everyones business. The sounds and scenes of nature all around. The ” Devil Birds” arrive to complete the act. Chasing each other in joyous encounter. Yelling! Screaming! In through doors, out through windows. No wonder the ancients gave them that name. They merge, and touch, making love as true lovers do. Twinkling stars, echoing satellites their lullaby. So much time in the air, their legs almost useless. Where they flop off, to launch into flight. At night I think, and dream of your courage! Undeterred by wild animals, or human wars. You are unique! The perfect flying machine. 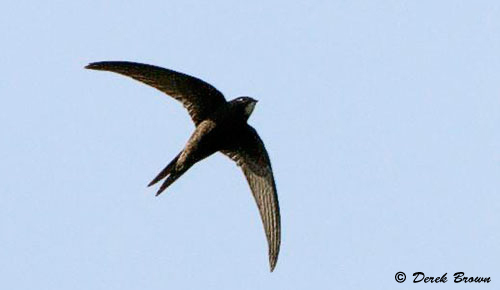 Swift – Swift in flight and name – Devil Bird, too. The Swift A.K.A The Devil Bird. I stumbled across your website after looking for photos of Swifts (they are my favourite birds) and I just had to leave a comment. Your work is beautiful and I really enjoyed reading it. I also read your welcome page and think that having a website is a wonderful thing – no matter what age you are! I am sorry to read about your wife, she was a very beautiful woman and your family pictures are ever so sweet.